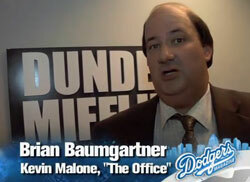 The Office’s Brian Baumgartner takes Dodgers Magazine on a tour of the set. And shows off an impressive collection of bobbleheads! It’s no wonder that Creed wants to use the women’s bathroom. :) Thanks for the tour of the office! Veeery interesting about the bathroom. I find it fitting that Kevin got his accounting degree from a correspondence school. Given what we learned in Scott’s Tots, he probably got it *after* he started working as an accountant! It was so cute when all the bobbleheads were lined up on the couches in the green room. Thanks for the tour Brian!